I doubt you’ll see a more h0-hum game in the second round of the playoffs than this afternoon’s. It’s clear that the Wild haven’t completely caught the attention of the Hawks’ faithful yet, and they haven’t caused the Hawks to think that they have to pull out the full arsenal. At least not yet. 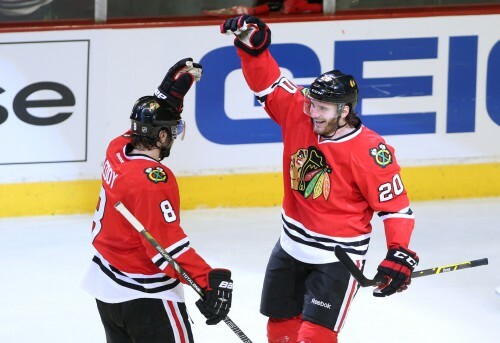 And the Hawks still lead this series 2-0 heading back to St. Paul. 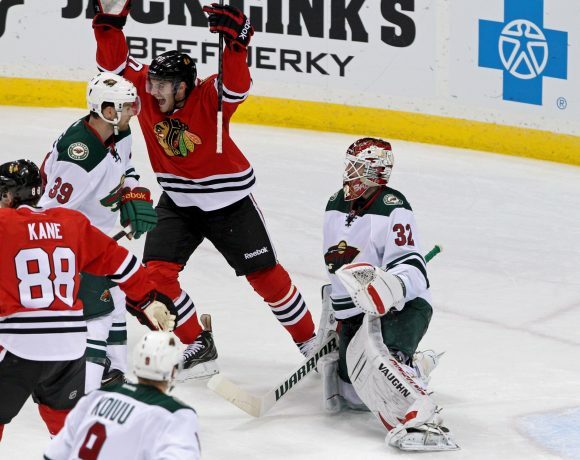 The Hawks exerted a lot of control in the 1st period, without using it to strangle the Wild. They held them to two shots while only managed seven themselves, though they the attempts were 12-4. While the 2nd shows the Wild got 13 shots, half of those were piled in during a power play and almost all of them came on one goalmouth scramble. The 2nd wasn’t really any looser than the 1st, and came capped off with a Brandon Saad laster into the top corner right after a power play after the Wild didn’t fully deal with a cross-ice pass from Bickell. While the Hawks weren’t as aggressive in the 3rd, it didn’t feel like they were completely turtling. The Wild got one goal off a really well-worked rush from Erik Haula and Cody McCormick (what?) but after that the Hawks soaked up whatever pressure there was and waited for a chance to seal it. They got two. Hossa hit the crossbar. Bickell didn’t. After the Wild goal they only managed six more shot attempts and it was pretty easily seen out. 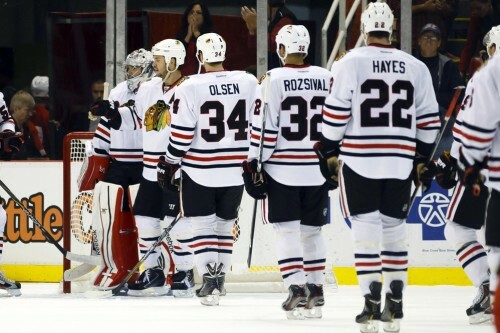 -The Hawks first goal was a perfect example of when it is ok to hang out beyond the red line. Bickell had gained possession and had time to look up, which is when Hossa made his break. It’s not when your d-men have barely regained possession–or haven’t at all–and are under pressure. It also sprang from Bicks supporting his d-man in the corner. And at some point, you knew the Hawks would catch Prosser and Stoner napping. 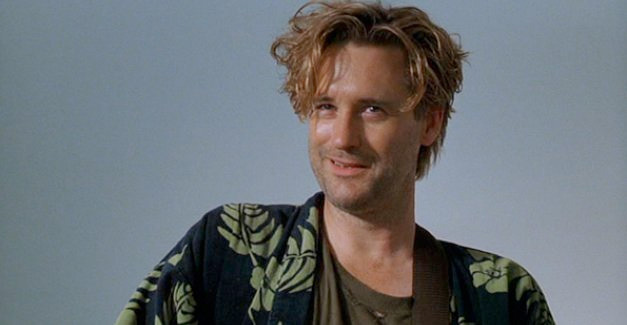 -Oh right, you probably came to see if my brain exploded when finding out Brandon Bollig was scratched for Morin. I’m not going to get too delighted about something that should have happened at least 50 games ago. But notice Morin and Versteeg created a chance on their very first shift. Didn’t prevent Steeger and Handzus from getting clocked in possession, but hey, mighty oaks from little acorns. -Nick Leddy only got two shifts after the goal against, and while he maybe could have been a little harder in the neutral zone I really don’t see how it’s his fault that Handzus lost his guy in the middle of the ice. But I gave up on using logic long ago. -When you check out Extra Skater, the real story is in the 5-on-5 close count, where the Hawks had 57% of the shot attempts. They had this game in control for most of it. 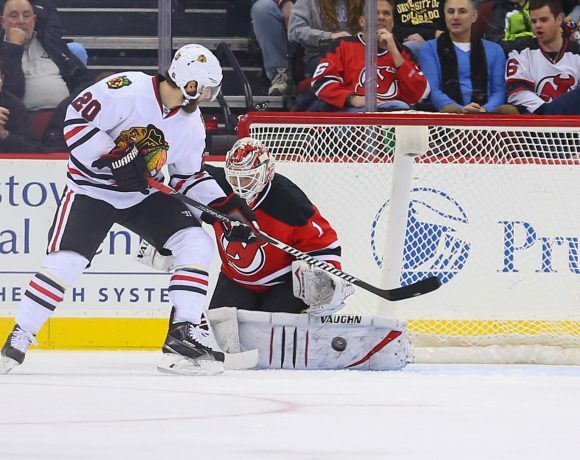 -I’m not exactly sure what Joakim Nordstrom has done to earn third line minutes in Shaw’s absence. But he at least knows enough to stay out of Brandon Saad’s way when The Marquis is playing like this. And that’s enough. -And that line was used as a genuine checking line, taking on Mikael Granlund’s line and getting the better of it. You would have thought being opened up to take on Minny’s third line would have led to a bonanza for Sharp and Kane, but it didn’t. Anomaly? There really isn’t much more to say. The Hawks will need to step it up on Tuesday in what has become quite the cauldron at The X. They tend to get better as series goes along, but we haven’t seen much of the A-game yet this spring. One good outing in Minny and this series will be over.